Stop by here to check out a fabulous charity drive/giveaway with The Original Scrapbox. With the right amount of clicks, they will have enough to donate to the Utah Children’s Justice Center. I like having quick and simple gifts on hand. Something not over the top, to gift away…..to someone who just needs a little pick-me-up. 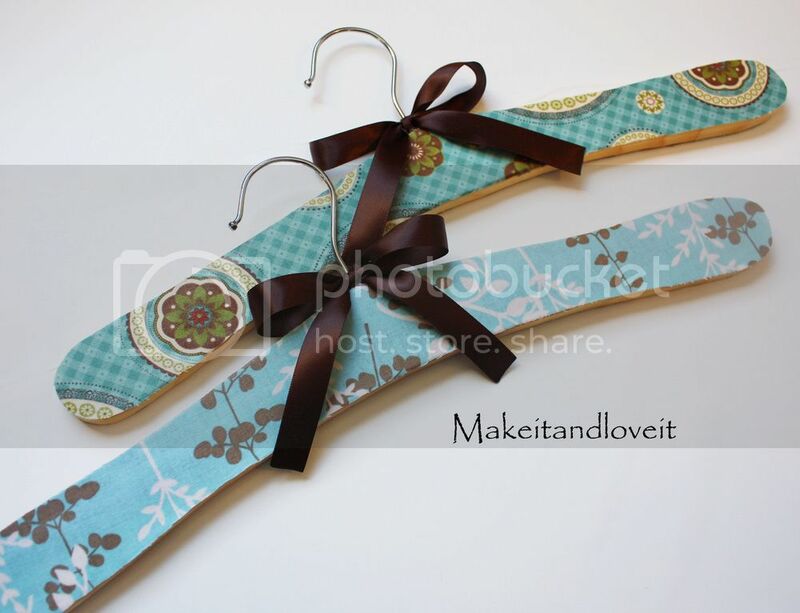 Or how about making a coordinating hanger for a new outfit you just created for someone? How sweet would that be. So here’s another simple something to add to that stash. I just used Mod Podge to adhere some fabric to each side of the wooden hanger. **Post Edit: I found these hangers at Joann’s Fabric in their $ bins. Nice and inexpensive. Thanks so much for mentioning the charity drive/giveaway! I love this idea. Where do you get the wooden hangers though? Great question Marlatt Five….I got them at Joann's and added that info to my post. Thanks! I love this idea! My sister just asked me if I had any extra hangers she could have…this would be a cute little gift for her. That is so cute! You can give them away — or keep them for yourself! I can just imagine a whole closet full of these! Simply FABULOUS! Thanks for sharing and love your blog! Awesome, and easy too! Good luck on your trip to Georgia (?)! Giveaway on my blog- perfect for Christmas! You come up with the cutest ideas! I love this. Great idea! I hope I can find these hangers. I've made a lot of aprons for Christmas presents and they would look totally cute with an accompanying hanger! Love this idea. Featured you on our site today. Grab our button if you want. Thanks for sharing your incredible ideas. I love your blog. So fun! I have been looking for small/child size hangers like this to throw in my baby shower gifts. Thanks so much fr the tutorial! I made some for Christmas gifts with Ikea hangers and they were so cheap and so nice! I made these hangers yesterday. I don't understand how you can get a clean cut with these. And when all was said and done, the mod podge was so rough that I wouldn't want to hang clothes on it cause it would snag. Please help me as I want to make these for my mom's house warming party. THanks. I made some and they look so cute, but I had the same problem. The edges are very rough. Any suggestions? Angela and Anonymous…..you know, I made these right before moving across country so I'm not sure where these even are. I wasn't even able to use them before all of the craziness happened with moving. I wonder if using a really fine grade sand paper would help to buff up the edges. Sorry about that. I should have tried them out first. Maybe even adding a thick coat of decoupage on them. Anyway, let me know if that works for you. And good luck! in my country there is no "mod podge"
I always love your writing, your ideas.. simple cute.. hope i can make it in my own home..
give me a passion to do that..